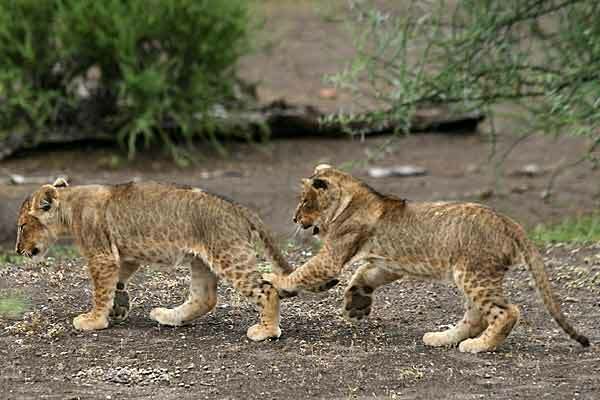 Caption: Baby lion siblings romping and play fighting, Mashatu Game Reserve, Tuli Block, Botswana. Did You Know? When a male lion ousts the existing dominant male and takes over the pride, he normally kills any existing cubs. He does this because a female can have a litter only every two years if she raises her cubs to weaning. However, if she loses her cubs she comes into season within as little as four weeks. So it is to the male's advantage to ensure the females in the pride are available for procreation as soon as possible after he takes over, othewise he may in turn be displaced before producing his own cubs.